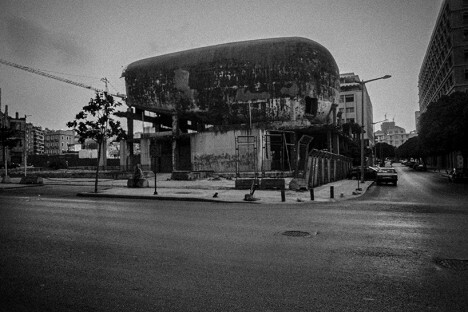 An abandoned concrete building in the heart of Beirut, Lebanon (known as The Egg) has been everything from a movie theater to a bomb shelter to a water tank, but this intervention would fill the gaps in its bullet-ridden shell with a series of lenses, reflecting images of the city into its cavernous void. 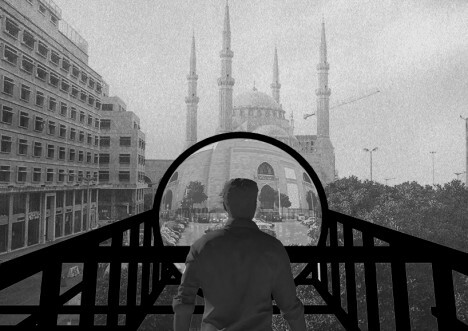 After a series of unsuccessful attempts to repurpose or restore the structure, architect and photographer Anthony Saroufim came up with an idea to give it a powerful temporary purpose, in part to tell the harrowing history of this war-torn city. 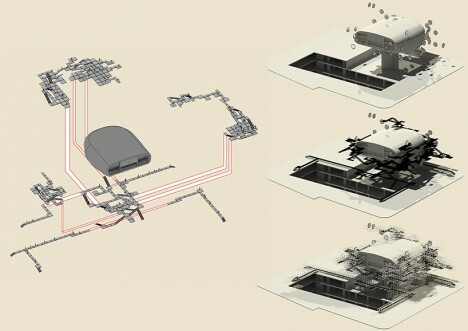 His proposal is illustrated in the haunting brown-scale images throughout this article. Scaffolding on the exterior would allow visitors to approach, walk up and around the egg, with circulation routes designed around gaps in the facade as well as civic features and landmarks to be reflected from outside. 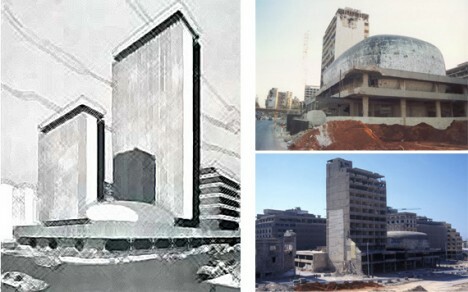 The Egg was commissioned 1965 and designed by the Lebanese architect Joseph Philippe Karam, but was intended to be part of a larger downtown tower complex: the Beirut City Center (original design and historical context images shown above not by Saroufim). It was to be surrounded with a mixed-use program malls and office spaces, a small piece of a large puzzle. 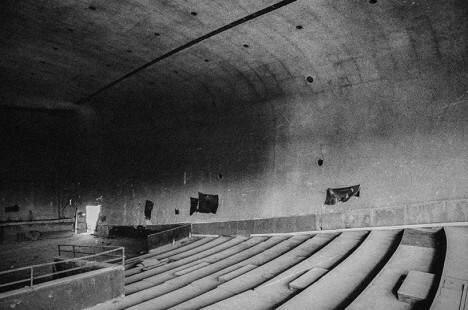 Indeed, now known variously as The Egg or The Dome, the structure was never officially given a proper name independent of the larger development. 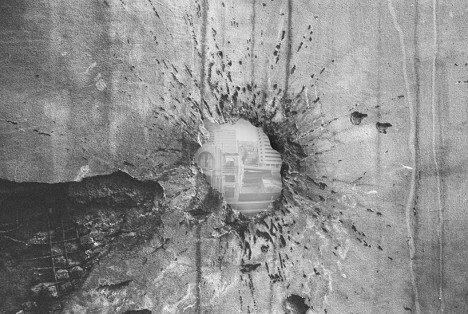 When civil war broke out a decade later, the plans were put on hold and many of the structures in the complex outside The Egg were destroyed in the conflict, partially or entirely. In the decades that followed, the structure was reused in a variety of ways, but always remained a large and monolithic work, much grander in scale relative to its surroundings than it was ever meant to be. 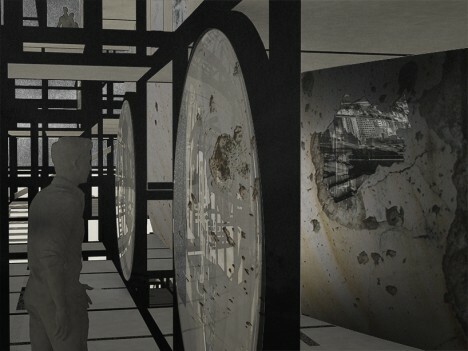 The camera obscura project proposed by Saroufim would involve inserting custom lenses all around the structure in the voids left from wartime impacts. 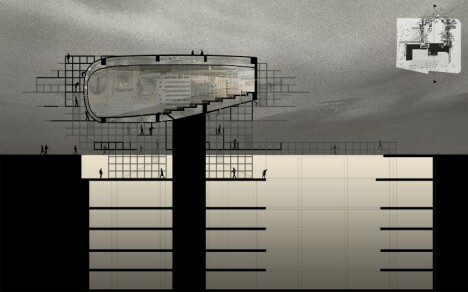 In turn, these would project city scenes from surrounding architecture into the giant empty interior volume. 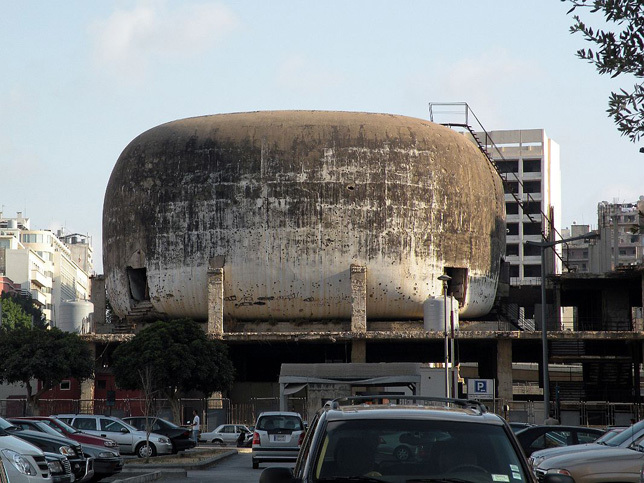 As an unrelated video project (above) illustrates, local residents are conflicted about the role The Egg should play in the next phase of the areas urban development, debating the merits of destroying or restoring it and leaving it to loom large. 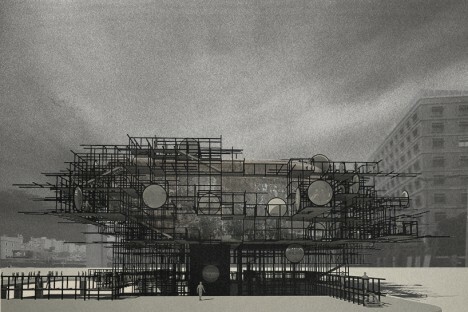 Some architectural and urban design proposals (such as the one shown above) call for letting taller structures grow up around The Egg as was the original plan. 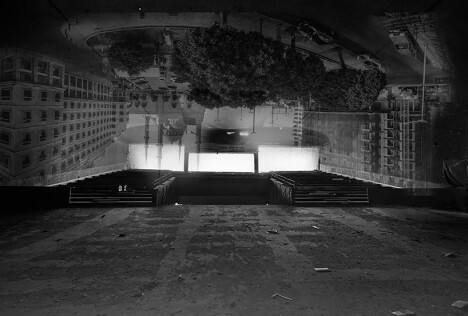 For now, this temporary installation project would give the Brutalist building relevant meaning in relationship to its historical context, bridging its storied past, unused present and uncertain future.